Gokartcentralen hosted round 7 of the Open GP Gokart Championship on Monday, March 7th. Going into the day, Grabko Grand Prix's Dan Grabko held a slim one point lead over Jonas Svanberg of Hesus Autosport for 6th in the championship standings. This just one year after the new team finished a humble 32nd in its debut season in the series during the 2014/15 campaign. So it was another big day for team and driver - and Dan Grabko delivered during qualifying, putting in his best performance of the season with 5th place on the grid. His time of 35.412 put him ahead of Bodin, Voric, and Jacobi, all drivers ahead of him in the championship. Unfortunately, the race did not pan out as the Grabko Grand Prix driver would have liked. Kart 19 had power delivery problems from the start, allowing Team VLR.nu driver Bodin to sail past on the start as the drivers came into the tight turn 2 hairpin for the first time. From that point it was a fight to maintain pace with the limitation of the crippled racing kart, and with 7 laps to go, Grabko finally succumbed to Adriano Voric after a mistake on the exit of turn 9 let the Adde Motorsport driver through. Dan fought bravely to retake the position, putting Adriano under heavy pressure on several occasions during the remaining laps, but it wasn’t to be as Voric maintained his composure and took home his 6th position to the checkered flag. So a 7th place finish for the second round running for Dan Grabko and Grabko Grand Prix, with lots of positives to take going into the final 3 rounds of the season. 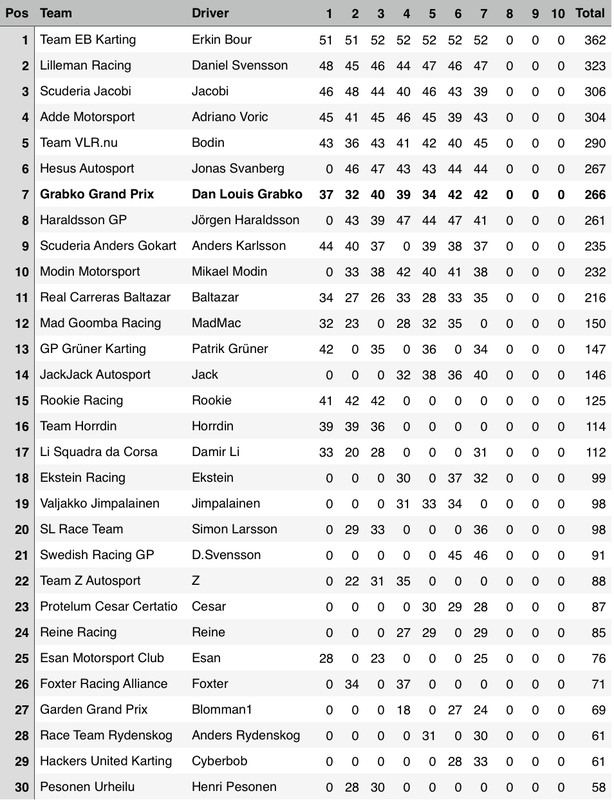 The result sees Svanberg leapfrog Grabko in the championship standings, but Dan was able to extend his lead slightly over Haraldsson GP’s Jörgen Haraldsson, a driver who has finished on the podium twice this season, by one point. That gap is now 5 points.